Money is an important part of marriage. 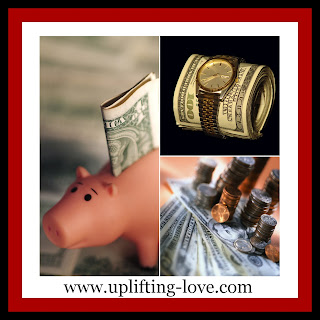 Marriage is not about money, however, you've probably heard people say that money can cause problems in a marriage. Maybe you've even experienced it yourself. But to a degree marriage is a business partnership: you purchase assets together, manage expenses, generate revenue, and enter into contracts (utilities, cell phones, subscriptions, etc.). The difference, however, is that the goal of marriage is love and happiness while the goal of a traditional business relationship is money. Earlier this week my sister and her husband invited Cami and I to go bowling with them. As we hadn't been bowling in many years and we enjoy spending time with them we accepted their invitation. Last night was the big night. We found a babysitter (Cami's sweet little brother), hit the road, and had a great time. I lost each of the games we played but in spite of that I had a good time. Businesses have owners. Sometimes it's just one owner who owns 100% of the company. Other times it's a partnership where two people each own 50%, three people who own a third each, etc. Unless the business is a non-profit company it has at least one owner. Ownership in a company is also referred to as having stock in a company. Ownership of a company, or stock, can be bought and sold just like cars, houses, toothbrushes, etc. The value of the stock is based on the value of the company. If the company is worth $100,000 and there are 1000 shares of stock then each share is worth $100. When the company's value increases so does the value of the share of stock and likewise when it decreases the value of the stock goes with it. Now there is a lot more that is involved in valuing an individual stock but this is basically how it works. Many years ago some bright individual realized that the average person doesn't have the time or understanding to routinely and successfully invest in individual companies so they created a mutual fund. They got a bunch of people to each contribute a sum of money, let's say $100, and used that money to purchase shares of stock in individual companies. 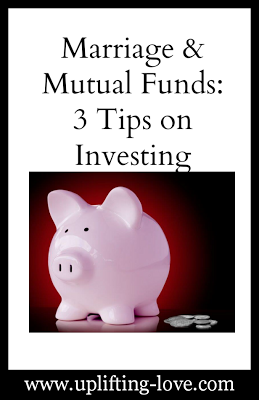 The mutual fund manager makes the decisions about which stocks to buy, when to buy them, and when to sell them. As the overall value of the stocks that the mutual fund owns increases so does the value of the mutual fund (the reverse is also true, mutual funds can lose money. Investing is not a sure thing). The individuals who contributed the initial $100 can then sell their ownership in the mutual fund (their share of the mutual fund though it's not typically referred to this way) to another person. In this way membership in the mutual fund, or ownership of it, can be bought and sold similar to how individual stocks are bought and sold. Here are three general rules of thumb that I initially learned from Dave Ramsey and have been reinforced countless times by my CFA friend. #1 Think long term. Investing for the short, in my opinion, is for experts. For people like me I recommend that they invest with a long term perspective. Looking at the S&P 500 (a stock exchange where companies can list their stock for sale) the average annual return since the 1920's is 11.34% (see here). That means that if history repeats itself (there is no guarantee that it will) you should earn between 11% and 12% at least. Therefore, look for mutual funds that have a return of at least 11% since their inception. #2 Make sure to look at the return of the mutual SINCE ITS INCEPTION. This means since it was first started. You want to make sure that its management is solid and has a good track record. Also make sure that it has been around for at least 10 years. Again, this is no guarantee that it will continue to perform as it has in the past but it is much more likely. Again, I want to reiterate that I am in no way an expert and these are merely my opinions but I have put these principles into practice in my life and am already seeing success (I've only been investing for six years). There are no guarantees when it comes to investing (I often refer to it as professional gambling) because no one can predict the future but if you're diligent, willing, and careful it can be a great way to build wealth. Dave Ramsey's "The 12% Reality"
As with anything, consult a professional if you have any questions. Let me know what you thought about this post in the comments. Did it help? Do you have more questions now? Was it too off topic? I love and appreciate your feedback! Just to clarify, I don't want to pull the money out, I just get a little nervous, okay? :) I love that I learn from you all the time. And I love the new look! Your website looks great! So do you...as your wife I can say that. I definitely understand why you put "think long term" twice. LOVE Dave Ramsey but hadn't heard of the 12% Reality. I'll have to look that up. Thanks! Thanks Fawn! Enjoy Dave's explanation. He has a knack for explaining things succinctly and clearly. I tell my husband all the time about thinking long-term. I'm in charge of the day-to-day budget and he does the investing, but he used to buy/sell a lot and I had to help him along in the long-term department. It's so important! Kiera, you're right about wanting to think long-term but your husband may be right to buy and sell regularly if he's investing in individual stocks and not mutual funds. Stocks are much more volatile and it can make a lot of sense to make frequent trades. However, if he's working with mutual funds there really isn't a need (probably). I do have one friend who enjoys the thrill of trading regularly. He and his wife decided to set aside a pot of money for him to "play" with that was small enough that if he lost it all it wouldn't destroy them but big enough that he could have some fun. That can work really well too because it is fun to trade. Money is a common and often central problem for couples, and as you've pointed out, especially for young couples. I'm so glad you tackled this and offered us some great information on the subject. I love what Dave Ramsey does and you've explained much of it here so well, Tyson. Great job, my friend! Money tends to be a big issue with marriage folks. However, always think partnership like you said. Being well informed is the best way to make those decisions :). Thanks for sharing with us @ My Favorite Posts SHOW OFF Weekend Blog Party! It's sad to see how money can rip a happy marriage, but I still know everything can be settled with proper conversations and agreements. Before anything else, set aside savings and as much as possible, do not pinch even a single cent from it. In my experience before investing it is our responsibility to get good advice from the experts in this field. While I agree that we should seek advice, preferably good advice, from professionals I disagree that it is our responsibility to do so. If one feels comfortable with how they are investing their money I say go for it! That's cool, that's really sound cool tips for investing and I hope if anyone will able to follow in such tips then he/she must be benefited on their mutual funds investments. Thanks my dear pal.